Dental Pulp Stem Cells: What’s New? 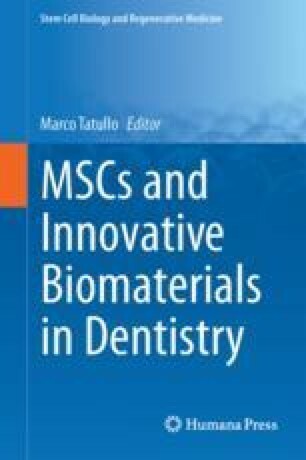 Since the discovery of dental pulp stem cells at the beginning of this century, there has been a rapid escalation of published reports describing the different stem/progenitor cells types derived from the oral cavity, the development of novel carrier biomaterials/scaffolds and bioengineering strategies for endodontic regenerative medicine. This chapter will discuss the most current developments utilizing dental pulp stem cells in regenerative dentistry, often employing multidisciplinary approaches. These encompass an understanding of the microenvironment of oral tissues, and highlight the differences between the types of tissues within the oral cavity. Identifying the appropriate bioactive molecules, such as growth factors, transcription factors, signalling molecules and enzymes has also been essential for the regenerative process. Furthermore, the mode of delivery of the dental pulp stem cells has been shown to be dependent on the structure and location of the damaged tissue being targeted. As such, a number of biomaterial used to generate injectable or solid scaffolds have been critically evaluated. The surface structure, extracellular matrix composition of the scaffolds used to deliver the cells, the biodegradability, porosity and release of specific bioactive molecules essential for the survival and maintenance of the dental pulp stem cells have been described. A number of proof-of-principle studies have focused on the efficacy, toxicity, proliferative, adhesive, migratory and differentiation capabilities of dental pulp stem cells within these scaffolds with in vitro, explant and in vivo regenerative experiments. Collectively these findings suggest that the bioengineering and delivery of tissue appropriate biomaterial, bioactive molecules and dental pulp stem cells for the repair or regeneration of the dentin-pulp complex is promising and progressing rapidly.